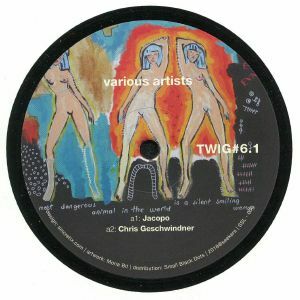 JACOPO/CHRIS GESCHWINDNER/MODEX/LAPUCCI Twig #6.1 vinyl at Juno Records. The latest release from Seekers offshoot Twig showcases a quartet of cuts by new recruits to the label's growing roster of artists. Jacopo kicks things off via the surging but squeezy synth bass and classic tech-house tropes of "Biloxi", before Chris Geschwinder joins the dots between Brown-era Orbital and jacking 21st century tech-house on acid-fired workout "Marie Pose". The B-side opens with out pick of the bunch, a jazz-dance friendly futurist house odyssey from Modex propelled by squiggly acid lines and rubbery jazz-funk bass, before Lapucci rounds things off with the deep space techno bounce of "Clouds On Mars".